The threat of nuclear annihilation has always been a theme at the forefront of science fiction, but nowhere is this more profound than in the cinema of Japan. The devastation of Hiroshima and Nagasaki loomed large within the frontal lobes of most filmmakers from the land of Nippon, but at Toho Studios, a long-running series of fantastical pictures that began with 1954’s “Gojira” (aka “Godzilla”), took the islands of Japan by storm and crossed the waters to tantalize audiences worldwide. The director who is associated most closely with these pictures is Ishiro Honda, a visionary whose work is often ignored, neglected and/or derided by many critics. That said, if Akira Kurosawa is to be considered the John Ford of Japanese cinema, I’d argue quite strenuously that Honda is the Nipponese Spielberg – an entertainer of the highest order, an expert stylist/craftsman and a serious film artist. Like Spielberg, Honda created a wealth of product that appealed to kids of all ages – from east to west and back again! Sadly, in the Western world, Honda’s work was so manipulated by American distributors that his dark, thrilling morality tales of nuclear mutated monsters were often reduced to the most basic elements of the monster movie genre with much of the political subtext removed in order to remain palatable to the narrow interests of the Occidental world. With substantial re-cutting and dialogue dubbing, most Western audiences lost out on the opportunity to not only enjoy rip-roaring entertainments, but also do so with considerable food for thought. In 1961, Honda’s “Mothra/Mosura” was a slight change of pace from his dark horrific explorations of the effects of nuclear radiation. The message of peace is still front and centre, but the delivery of this important missive has a colourful, fantasy-infused lightness. Dappled, as it is, with this lightness of tone and touch is what gives the audience a fresh perspective and creates a creature-feature endowed with a very unique vantage point. When a strange island is discovered in an area spoiled by nuclear contamination, the world comes face to face with a civilization that devotes itself to worshipping the splendours of the natural world. On this island are two beautiful miniature women – fairies who sing the loveliest of melodies. When an unscrupulous promoter kidnaps and subsequently forces them to perform in his circus, a ragtag group of journalists seeks to rescue them – especially since the tuneful crooning becomes mournful and summons the awakening of the ancient monster Mothra. This snail-like behemoth eventually cocoons and transforms into a horrifying winged beast hell-bent on rescuing the fairies and wreaking major havoc upon the towns and cities of Japan - most notably, Tokyo. Blending slapstick humour with the sort of destruction one expects from Honda’s monster pictures, “Mothra” is a magical and supremely entertaining thrill ride. Amidst the serious thematic concerns about Western greed and exploitation the entire concoction delivers a fine homage to “King Kong” and a delightful mix of laughs and thrills. The humour is, thankfully, not tongue-in-cheek, but rooted in the characters and situations so that, while broad, it never renders the picture into a knowing gag-fest. The hallmark of Honda’s work is undoubtedly his handling of the carnage and “Mothra” does not disappoint in this regard. When our title monster transforms into a flying avenger, the force of its wings beating is enough to create hurricane-like winds that send cars, trucks and tanks hurtling into skyscrapers. A considerable chunk of the running time in the first half is devoted to a debate between the forces of exploitation and those who desire a more harmonious relationship to the forces of nature. Within these debates, humour abounds – thanks mainly to the comical turns by the blustery Frankie Sakai as the rotund reporter “Bulldog” and the fiery female photographer Michi (played by the delightful Kyoko Kogawa). Jerry Ito is a deliciously slimy villain while fave Kurosawa thespian Takashi (“Ikuru”) Shimura makes a welcome appearance as the news editor who lights a flame under his writers’ butts and has them become actively involved in the proceedings. The real life singing sensation twins (the Ito sisters), known to the world outside of this film as “The Peanuts”, deliver great screen presence and are in very fine voice. 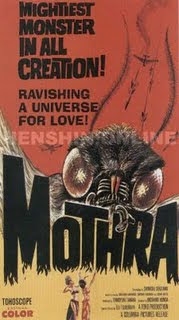 Ultimately, “Mothra” does not disappoint and lovers of Japanese monster movies will get their fair share of peace through superior firepower as the title monster must be cruel to be kind as it cuts a huge path of destruction in its instinctive, single-minded purpose to rescue the twins. It’s a terrific monster movie and one of the best from Toho Studios. Lovers of this fare will especially be delighted, but even for those not immersed in the canon of Nipponese behemoth pictures, the pleasures to be derived are immense indeed: great carnage, lots of laughs and a worthwhile message about peace and ecology – the latter of which is way ahead of its time. Sony’s great DVD collection is an especially worthwhile buy for anyone who worships this genre. You not only get s fantastic commentary by Honda scholars, but the transfer to DVD is gorgeous - with deep blacks to offset the vivid colours. Most importantly, the original Japanese version with English subtitles can be viewed along with the truncated, dubbed American version. The only flaw is the horrendous packaging with all three discs in the collection packed onto one spindle – each movie on top of the other and a definite accident waiting to happen. “Mothra” is available on Sony’s New DVD release “Icons of Sci-Fi: Toho Collection” with two other Ishiro Honda classics “H-Man” and “Battle in Outer Space”.